Christian White’s Victorian Premier’s Literary Award winning manuscript has been sold in nine more territories by Affirm Press. The sales, facilitated by NYC based Linda Kaplan, took place in the weeks immediately after the announcement of the VPLA with international publishers including HarperCollins in the UK, Goldmann in Germany, Denoel in France and St Martin’s Press in the US among the winners. The manuscript, previously called Decay Theory and now retitled to The Nowhere Child, is a pacey suspense thriller set between Melbourne and Kentucky. Affirm Press has subsequently signed Christian for a second book. It is proving a massive year for author Christian White, who was printing T-shirts for a crust just six months ago. Now, aside from winning the VPLA, signing a two-book deal with Affirm Press and selling the rights to The Nowhere Child in nine territories, Christian is also co-creating the television series Carnivores with Tony Ayres, has won the Best Short Form Script at the 2017 AWGIE Awards, and has a film he co-wrote called Relic in production with Carver Films (The Snowtown Murders, Partisan). Christian said he’s not entirely sure what’s in store for him next year but he’s looking forward to the ride. The Nowhere Child is scheduled to be published by Affirm Press in July, 2018. ‘As pleased as we were to acquire The Nowhere Child, the highlight has been working with Christian White. His talent is matched by his character; we can’t wait to introduce him to Australian book lovers and look forward to collaborating with him on many more books in the future.’ said Affirm Press Publishing Director and CEO, Martin Hughes. Denmark (Rosinante), Poland (Czarna Owca) and Israel (Korim Publishing House). 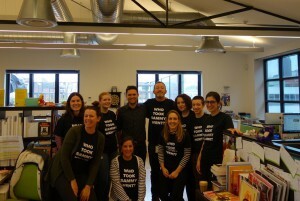 Christian with the Affirm Press team, wearing ‘Who Took Sammy Went?’ t-shirts.